When I first laid eyes on the 2018 Honda Africa Twin Adventure Sports at the Long Beach International Motorcycle Show, I thought to myself, “Dang that’s a nice paint job and I love the white frame, but man, what a long name.” After talking to some Honda reps about the bike’s intended place in the market and in its own line-up, I left the conversation a bit more confused than when I had started. You see, the Africa Twin Adventure Sports is aimed to more directly compete with the bigger adventure motorcycles that publications and consumers alike, were already comparing it to. The new AT AS would offer longer distance touring capability as well as what would be perceived as more off-road-worthy accoutrements. We have seen other manufacturers take adventure bike platforms and aim one model solely at street performance and the other at more off-road focused duty, so where does the Africa Twin Adventure Sports land? Honda says to think of it more as an “SP” model off sorts, referring to the upgraded CBR1000RR SP. The Dunlop Trailmax tires fitted to the Adventure Sports did just fine for light off-road duty while still offering good grip for carving canyons. But wait! It gets more confusing before the fog clears when it comes to the 2018 Africa Twin model line-up. The standard Africa Twin receives a fair amount of updates – all of which, and more, are found on the AT Adventure Sports. The standard Africa Twin gets a fair amount of upgrades for 2018, including this rad matte black color scheme (Manual model shown). The finish of the entire Africa Twin Adventure Sports exudes quality from the 30th Anniversary paint scheme, to the anodized rims and handlebar. Shown above is the DCT model, evident by the extra dual-clutch transmission bits on the right side of the motor. That’s a pretty substantial list of upgrades on its own, but how is the Africa Twin Adventure Sports differ from the standard AT? Let’s take a look at another easy-to-read bullet-point list! Honda offers a fairly large list of accessory parts for the Africa Twin line-up as well, seen here the AT AS is outfitted with lights and sidecases from the Honda accessory catalog. The $1,500 difference in price between the standard Africa Twin and the Adventure Sports seems paltry when considering the bolt-on accessories included on the AS on their own add up to more than the difference in price between the two models, and that isn’t even considering the larger fuel tank or 30th anniversary color scheme. 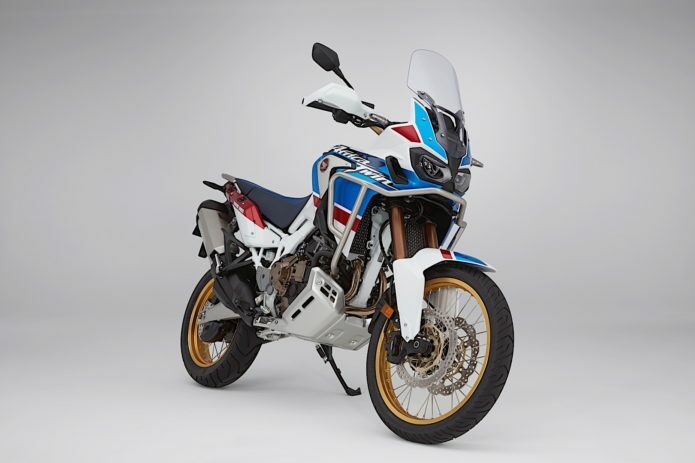 Making the AT AS even more enticing is the fact that the accessories included are incredibly useful and likely to be some of the first parts an Africa Twin owner might purchase on their own anyway. As tested, the 2018 Honda Africa Twin Adventure Sports DCT rings in at $15,699. Want to kick it old school and shift gears yourself? It’ll save you $700 with it’s $14,999 MSRP. So, why wouldn’t you want to purchase the Adventure Sports model if you found yourself considering the Honda Africa Twin? While it’s hard to think of many reasons, a couple do come to mind. Adding 1.2-inches to the seat earns the Africa Twin Adventure Sports the award for tallest seat height on a large-displacement adventure bike at 36.2-inches in the standard position and 35.4 in its lowered position. Once you’re rolling, it really doesn’t matter, but with my 5-foot 8-inch height and 30-inch inseam, it made mounting and dismounting the motorcycle the most nerve-wracking part of my time with the new AT AS. There is a lower accessory seat available to help in that regard. Also, if you’re happy with the set-up on the standard model, maybe you don’t want to spend the extra cash or add the extra 25lbs of weight. My personal adventure bike’s seat sits at 35-inches and I’ve gotten used to it, but the Africa Twin Adventure Sports ups the ante at a towering 36.2-inches in its standard position and 35.4-inches in the lower position. It’s OK, just keep moving, and it won’t bother you. I would personally opt for the Adventure Sports over the standard AT, buy that lower accessory seat, slap on more aggressive tires and some larger footpegs for more comfort over long periods of standing, and would probably be fairly content with the bike in stock form. The AT AS is pretty solid in stock form, but for some real adventure riding, I would opt for more aggressive tires and larger footpegs. Honda opted to bring all Dual-Clutch Transmission (DCT) models for our test of the Adventure Sports which would mark my first time riding the Africa Twin with the DCT transmission. This would also be the first time I had used the DCT transmission off-road – my previous experience with the tech being a day ride on the similarly equipped DCT 2018 Honda Gold Wing Tour. Some of the extra components adding 22 pounds of weight to the DCT model can be seen on the right side of the bike. Thankfully, the AT AS’s larger bashplate should direct flying rocks away from those extra bits – and also away from the exhaust headers. Across the Africa Twin line, the screen has a shallower angle which was said to allow riders to see the screen more easily while standing. It still wasn’t as easy to read as some TFT displays I have used and you need all the help you can get because there’s a lot of information to look through. Thankfully, with the DCT on the Africa Twin being highly adjustable, with enough time, I believe you could very easily fine tune the system to work as you might want. Once the motorcycle is flipped on, you start in neutral then use the right switchgear to set into Drive mode. Leaving the bike in Drive will keep the bike in a fairly subdued almost economy-type setting, so we opted to switch the motorcycle into Sport mode which also has three settings within it. Sport 1 being more sporty than drive while still shifting quite low in the rpm, Sport 2, which was preferred for most of our group of riders, still keeps shifts smooth while allowing the bike to rev fairly high into the rpm range, and Sport 3 which will let the bike rev nearly all the way to redline when on the throttle hard. Sport three was just a bit aggressive for most of our riding even during canyon stints. The reality is, that the shift points also have a lot to do with how you get on the throttle as to how aggressively the transmission will interpret your input and shift accordingly. Grab a handful on the highway to pass a car and the bike will likely downshift twice to put the motorcycle into the powerband to give you the necessary oomph to pass. Try as I might to be open-minded to Honda’s DCT technology, when the going got technical, off-road or on, I still preferred to set the AT AS to full manual, making use of the paddle shifters on the left switchgear. With the DCT transmission working well for our time on the highway, through town, and through less demanding sections, I was fine leaving it in Sport 2 and letting the motorcycle shift as it may, knowing that I could up or downshift the motorcycle at any time manually with the paddle shifters on the left handlebar switch gear. I gave the DCT system a try both off-road and through tight canyon roads, but found myself constantly shifting the motorcycle back down a gear or two at times to keep it in the powerband through corners or when I needed a quick hit of power to spin up the rear on the dirt. The other issue I had was as I would downshift to enter a corner, the motorcycle would upshift before the corner was finished if I wasn’t hard enough on the gas. These situations left me preferring to set the motorcycle into full manual mode, using the paddle shifters to do all of my shifting, precisely when I wanted to. I can appreciate the fact that Honda chose to only bring DCT models, forcing everyone to try the system rather than letting them choose, but for the 22-pound weight savings as well as saving $699, I would probably opt for the manual and spend that money on the aforementioned seat, tires, and larger footpegs. The AT Adventure Sports’ off-road prowess made our time spent on Mars (aka the Prescott National Forest) an absolute blast. The transmission is so smooth at low rpm that in manual mode it never lugged so low in rpm that it became jerky and was just fine tip-toeing around off-road. To be clear, our off-road sections consisted mostly of long blasts down fire roads with only a few shorter more technical bits. 1.3-inch taller handlebar and wider footpegs made the AT AS feel great while standing, although I would still opt for wider, longer footpegs. I felt in command of the bike at all times whether I was taking advantage of the wide open 43-degree steering lock while moving around slowly, or testing the limits of HSTC setting 1 with perfectly controlled power drifts. Adjustable suspension front and rear allows riders to fine tune their set up. The Adventure Sports Showa suspension isn’t just roughly an inch longer front and rear; it also has a higher spring rate, which likely helped with the extra weight and felt great during the light off-roading we encountered, plus it prevented the suspension from feeling overly soft as we blasted through tight canyon roads. Honda did a great job finding a happy medium. Hopefully we can get our hands on the AT AS soon on our home trails to test how well the suspension can soak up larger bumps on more technical trails. The 998cc Parallel-Twin engine doesn’t feel as spunky as other adventure bikes on the market, but it’s no slouch, either. Off-road, it has more than enough power to send its claimed 555-pound curb weight barreling down the trail at speeds that could get you into trouble fairly quickly. The engine has remained relatively unchanged from its original debut in 2016. Even with the addition of ride-by-wire across the Africa Twin line-up, cruise control is still nowhere to be found. Nissin braking components offer plenty of bite on-road while not being overly sensitive off-road, and ABS is able to be turned off to the rear wheel for off-road stints via a dedicated button on the dash. The front ABS cannot be shut off. A dedicated button for turning off ABS to the rear wheel is located on the dash, as is the “G” button which enables quicker clutch actuation for use during off-road riding. You must be stopped to engage either of these options. Next to the ABS button is the “G” button, allowing for quicker clutch actuation putting power to the ground more quickly which helps with split-second decisions on slippery surfaces such as gravel. I was somewhat surprised with just how much I enjoyed riding the Africa Twin Adventure Sports. With the motorcycle feeling almost infallible off-road, allowing for small mistakes without becoming uncomposed, and predictable easy handling on-road with all day comfort, the AT AS was an absolute blast riding around Prescott, AZ. It was really no surprise when Honda showed us statistics that placed the Africa Twin as the number two selling bike in the Open Adventure bike category with 21% market share. With over 8,000 sold in the last two years in the U.S, and 51,000 sold worldwide, it seems the motorcycle-verse was poised and ready for the return of the Africa Twin, and the Adventure Sports just takes the adventure further. Trail 4.37 in. 4.44 in. Length 92.3 in. 91.9 in. Height 61.8 in. 58.2 in. Seat Height 36.2 in./35.4 in. 34.3 in./33.5 in. Ground Clearance 10.7 in. 9.9 in. Wheelbase 62.2 in. 62.0 in. Curb Weight 555.8 lbs. 533.0 lbs. 530.0 lbs. 506.8 lbs.